Officials in Brazil have started kicking out Olympic ticket-holders for having signs of clothing protesting the actions of acting President Michel Temer — we’re going to do a quick primer on politics in Brazil, then explore this history of protest at the Olympic games. Jules Boykoff, political scientist and former Olympic athlete who’s authored three books about the Olympics. 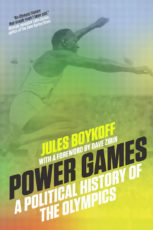 The latest is Power Games: A political history of the olympics.